A haven of fauna biodiversity, the Amazon rainforest covers an astonishing 5.5 million square kilometres and is home to over 10% of all the wildlife species known to man, Contrary to popular belief, not all rainforests are created equal, and the kind of flora and fauna in the Amazon is not found anywhere else, this is why conservation is at the forefront of innumerable environmental groups in South America. This is our planet’s very own Garden of Eden, where you’ll find a dazzling array of fascinating, bizarre and even deadly creatures. In total, scientists estimate there are 2,000 species of birds and mammals here, more than 2,000 species of fish, over 400 amphibians, and almost an equal amount of reptiles. If you’re into animal spotting then you really couldn’t pick a better place to visit. Heading off on an unforgettable Amazon adventure this year? These are all the amazing animals you can spot on your journey! You’d have to be a hard-core ice block not to fall in love with the seductively sweet face of a sloth. 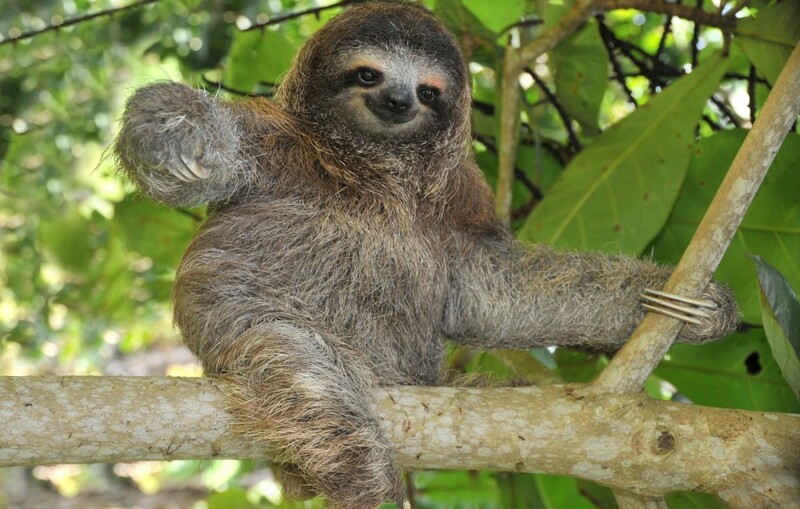 One of the strangest creatures on earth, sloths are insanely slow at just about everything. It takes them a month to digest a meal (and you thought your metabolism was slow! ), love to sleep for 10 hours a day and takes them about a week to work up the strength to come down from their tree spots to relieve themselves. Sloths may be hard to spot at first but with an experienced guide and a keen eye you should have no problems zeroing in on at least one during your journey. The good news? They’re awesome posers giving you all the time in the world to photograph them at will once you find one! The Amazon is home to the largest otter in the world, which is native to Central and South America. 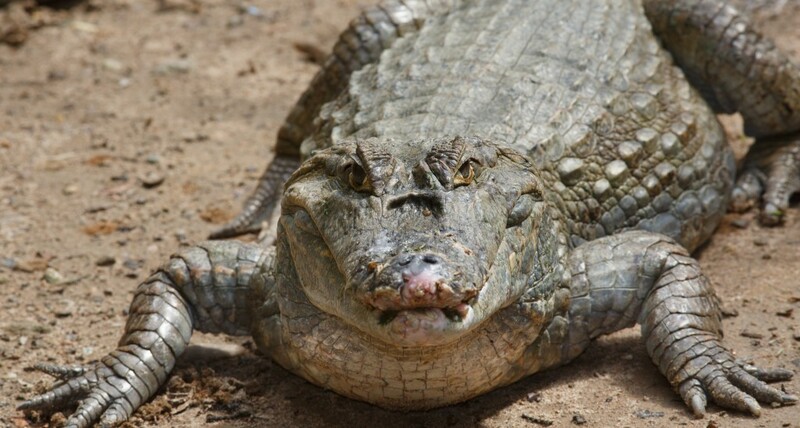 It lives along the Amazon River and the Pantanal and can reach lengths of up to 1.8 metres. 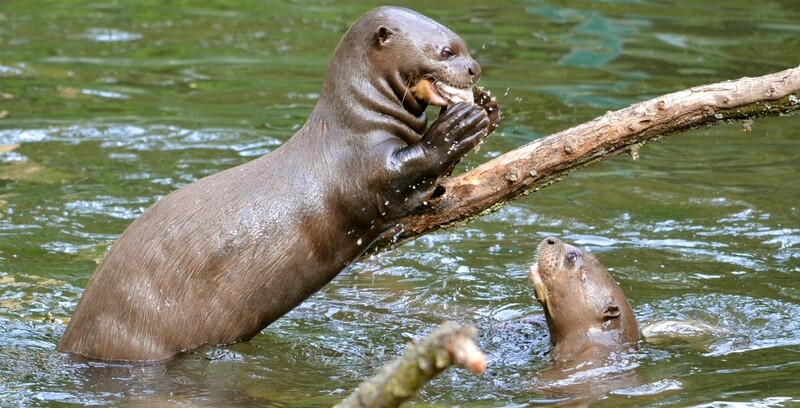 One of the most endangered of all Amazon wildlife, due to overzealous hunting, the best chance of seeing Giant River Otters is on an Amazon River cruise in Peru. Imagine how big we’d get if we were to continually grow in height and size throughout our whole lives? If we were anacondas, that’s precisely what we’d do! The boa constrictor of the Amazon River is a formidable creature which can measure up to 6.5 metres in length and 250 kg in weight. Scary and enticing in equal measures, the anaconda kills its prey by suffocation, before proceeding to ingest the meal hole. Yes, we know you knew that…everyone has seen at least one YouTube video of some dude who fell asleep in the Amazon and woke up inside an anaconda! Arguably the best known and most spectacular (not to mention loud!) bird in the Amazon, the toucan’s trademark colourful bill is a powerful saw-like tool used to squash fruits and large seeds. 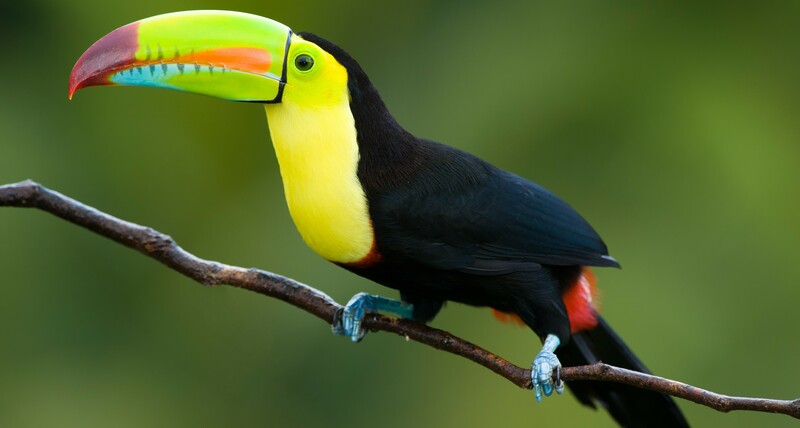 There are about 40 different species of toucans living in the Amazon, of all sorts of shapes and sizes, and due to their magnificent colours are among the easiest to spot animals. Renowned as the giants of the parrot family, macaws are the largest of the lot and boast amazing long tails which are often longer than their entire bodies. 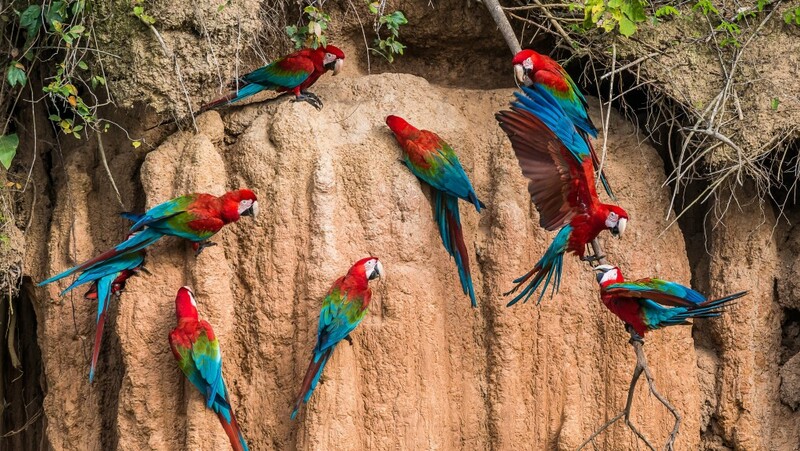 Due to the illegal trade of macaws as pets, and deforestation, their numbers in the Amazon are on a drastic decline. Intelligent, sociable and curious, macaws can live up to 75 years of age in captivity. The Black Caiman is the largest predator found in the waters of the Amazon River, where he finds no threat except humans. They subsist by eating capybaras, piranhas, Giant River Otters and the odd man, here and there. The largest specimens can grow up to 6 metres in length and weigh an eye-watering 1,360 kg. 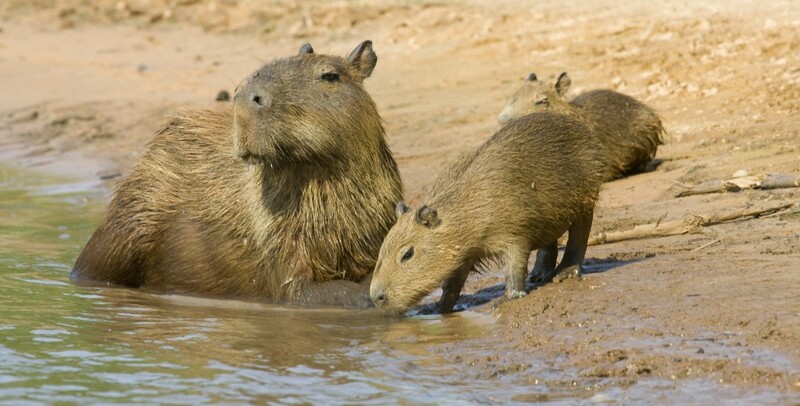 The world’s cutest and largest rodent can weigh up to 50kg and lives among dense tropical forest growth alongside lakes and rivers. Their partially webbed feet make them excellent swimmers despite their rounded bodies, and are much slower on land. Their natural predators in the Amazon are jaguars, anacondas and caimans, although humans still pose the largest threat as capybaras skin and meat is commercially traded. There aren’t many Amazon Pink River Dolphins left in the world, but on a spectacular adventure trip to Rurrenabaque in Bolivia, or a river cruise in Iquitos (Peru), you’ll have the unforgettable chance to canoe alongside these stupendous creatures. Shrouded in mystery and legend, the Pink River Dolphin escaped much hunting due to local superstitious belief that they boast supernatural powers. 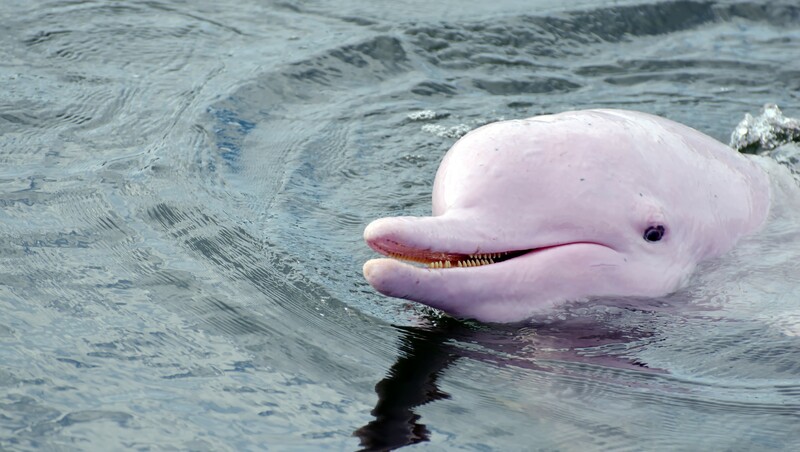 There are various types of pink dolphins living in the Amazon basin and, in January 2014, a brand new species was discovered, something which hadn’t happened in over a century. A curious fact about pink river dolphins is that when they get overly excited their skin gets extremely bright in colour…much like humans blushing. Considering their diminutive size, it’s curious to know piranhas can instil sweat-inducing dread in even the most macho of men. 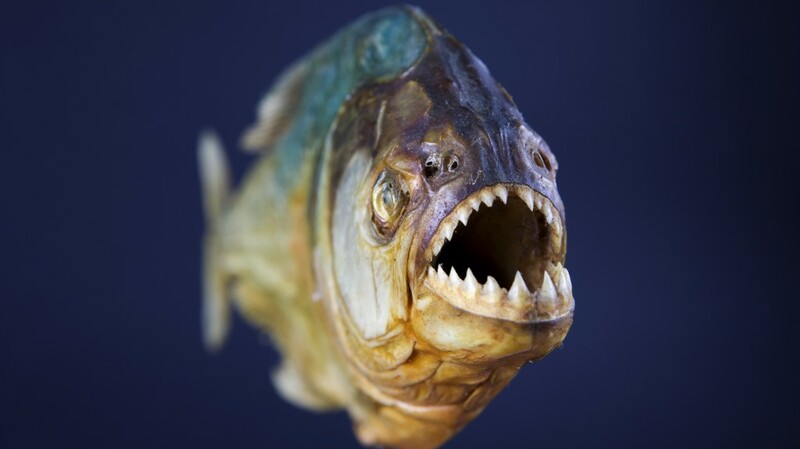 To their defence, piranhas do have razor-like teeth and jaws so powerful they can munch from flesh through bone at lightning speed, so the fear is not exactly unfounded. They’re great predators en-mass and have been known to attack – and kill – large creatures like anacondas and capybaras. 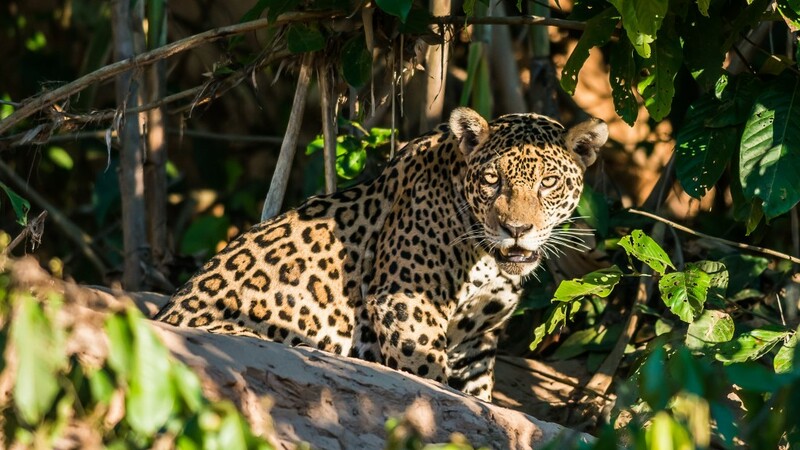 Stunning, elusive and endangered, the jaguar also rates as one of the most dangerous predators living in the Amazon, this multi-tasking ace can swim, jump and run with enviable ease and, much like tigers, are as at home in the water as on land. No matter where they live, they also have no predators, bar humans. The thirds largest cat in the world (after lion and tiger) the jaguar is the epitome animal-spotting target of all in the Amazon. All excited to see this wildlife yourself? Check here for all trips and information for trips to South America and the Amazon. Refugio Amazonas is ideal for science enthusiasts, soft adventurers and families; located in a 200-hectare private reserve within the buffer zone of the Tambopata National Reserve.